I was rummaging through my daughter’s collection of toys, games and books one day in her room while attempting to do some early spring cleaning. I spent a few minutes reminiscing on the time we purchased each item for her, the sweet memories behind each one is priceless. The grape juice stain on one the pages of her book, the missing eyeball on one of her bears… they all held a special memory. It’s one thing for us as parents to remember and share these with our children, but it’s not always easy for them to remember for themselves — they’re too young. On top of that, having their name on something let’s them know that that particular item belongs just for them. And you know how territorial these kids can get. I came across Paper Hat Press and knew I just had to have one of their custom hard cover books just for my little girl. She loves to read! What is so exclusive about this custom book is that it’s very personalized to your child, not just with their name, but their appearance, their unique interests and qualities and even a chance to include the name of their sibling and parents/caregiver too. Constructed in a beautiful hard cover filled with vibrant pages of images and a wonderful and engaging storyline, this is the perfect gift for your child, or even as a great custom gift for your niece, nephew, grand-child, etc. It was extremely easy to create online. You can even choose the child’s eye/hair/skin colour and length of hair to resemble the child and another special add-on — the ability to add a personal dedication in the beginning of the book. It’s like you’re the author! Just 3 easy steps and your custom book will be on it’s way to you! 1) Choose a book based on the child’s age and gender. 2) Personalize the book by simply entering basic and optional information about the child (name, birthday, favorite food, etc.) on the guided order form. Customize the character (choose eye color, hair color, length and style, skin tone) to resemble the child you are buying the book for. Add a personal dedication for the child. 3) Receive your personalized book within 1 week via express FedEx shipping, or within 2 weeks via standard FedEx shipping. I was impressed with how quickly I received my book! Each book comes specially wrapped in kraft paper that can be folded into a paper hat! I was instantly satisfied with the book the moment I held it in my hands and with the cover alone. The book was filled with 25+ pages of personalized content (so you’re not just getting a hard cover book with very little pages — this offers a lot more!) and the little girl in the book really reminded me of my Ava! From the hair right down to the boots. Amazing. I know the boots was a coincidence but just the appearance alone blew me away. We chose Little Sparkle because I always tell my daughter that she lights up our world. This is what we added as our special dedication to her right on the first page of her custom book. Reading the book together was such a treat for Ava. The look on her face when she heard her name and even the name of her brother… priceless! There are a lot of things I love. Products I endorse, recommend, and share with my audience. But I have to say that this may just be one of my absolute favourites. It’s one of those items that really tug at your heart strings and will forever hold a special place in your heart and those of the ones you love. Our next purchase will definitely be for our little boy. Currently the books are on sale for $31.95 from the usual $39.95, so it’s a great opportunity to jump on it! PLUS, receive 25% off your next order by entering code PAPER25. 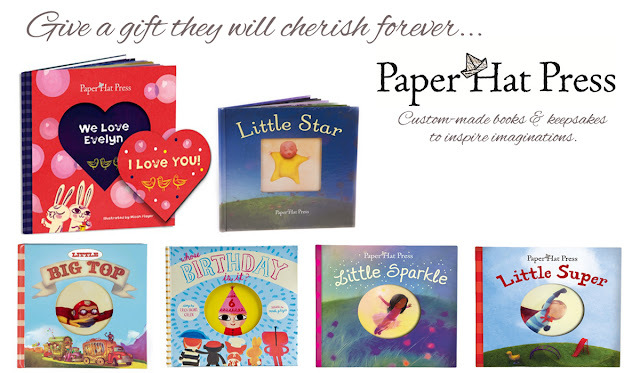 If you want to learn more about Paper Hat Press and their selection of books, visit them at: http://www.paperhatpress.com. I came across this article and wanted to let you know that Paper Hat Press products are no longer available! Build A Children’s Book is a similar company that you might enjoy, which has even more customized options for their books. Thanks for the tip and I will definitely make sure to visit your site! I love this! When I was a kid, I could NEVER find anything with my name in/on it. It was too rare. My brother was always able to find his name, though, and I was always so jealous! This is such a great idea for birthday or christmas presents. I’m pinning this into my christmas idea folder for the kids. I think my kids would love this and it’s something they can pass on to future generations.